DOUGLAS COUNTY, Mo. Driving while drunk is a poor choice for anyone willing to take this chance behind the wheel. 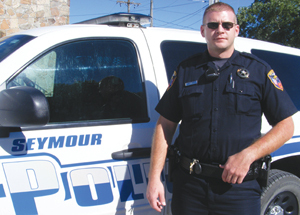 When a law enforcement officer gets caught, while in a patrol car, it is the worst choice. Jesse Lafferty just started with the Douglas County Sheriff’s office July 1st. He asked to work a little overtime last night telling Sheriff Chris Degase he was working on an investigation. Lafferty wasn’t. He wasn’t even in his uniform. When the sheriff finally found out what Lafferty was up to, he had to call in the Missouri Highway Patrol to investigate. “What prompted this, I don’t know. In light of all the bad publicity that law enforcement’s getting, I hate this. You cannot imagine how disappointed and upset I am over this former deputy’s actions,” says Sheriff Degase. Sheriff Degase tried to check on Lafferty. He tried calling him on his cell phone and radio. Sheriff Degase also asked dispatch to call him in to the sheriff’s office. “We lost radio contact with him so we were kind of in a panic mode trying to locate him,” explains Sheriff Degase. Lafferty’s wife also called the sheriff’s office after getting frantic phone calls from him. “He still was unable to tell us exactly where he was,” he says. The sheriff tried pinging Lafferty’s phone while another Douglas County deputy started combing the area. “We located him. He had had a motor vehicle accident at the junction of K Highway and 14. He had been traveling south on K and when he came up to the intersection of 14 and the stop sign he didn’t stop, went completely across 14 Highway,” explains Sheriff Degase. Lafferty ended several yards into the woods, slamming his patrol car into a tree. The airbag went off but he still hit his head on the windshield. Some branches, and brush is lodged into the back end of the car. Sheriff Degase knew something wasn’t right about the crash. “When I got there, I smelled it. I can tell by his actions. His words were slurred,” he says. After the first breathalyzer test came back with a high alcohol reading, the highway patrol was called in to take over the investigation. “We have a zero tolerance here for driving while intoxicated. We have strict policies we follow regarding the public and how we handle DWIs. We were not about to handle it different since it was involving an officer,” says Sheriff Degase. Once Lafferty was told he was going to jail, he asked to be seen by a doctor instead. He was never officially booked in jail so no mug shot was available. He is charged with a DWI and careless and imprudent driving involving an accident. Sheriff Degase says the patrol car is likely totaled. These charges will be sent to the state. Lafferty will likely lose his peace officers license if convicted.